Often sold in dime stores, I remember shelves of this stuff in Woolworth's. Original price tags may be under a dollar! So with that in mind, here are a few pieces of lowbrow, poor quality vintage items I own, and call kitschy. 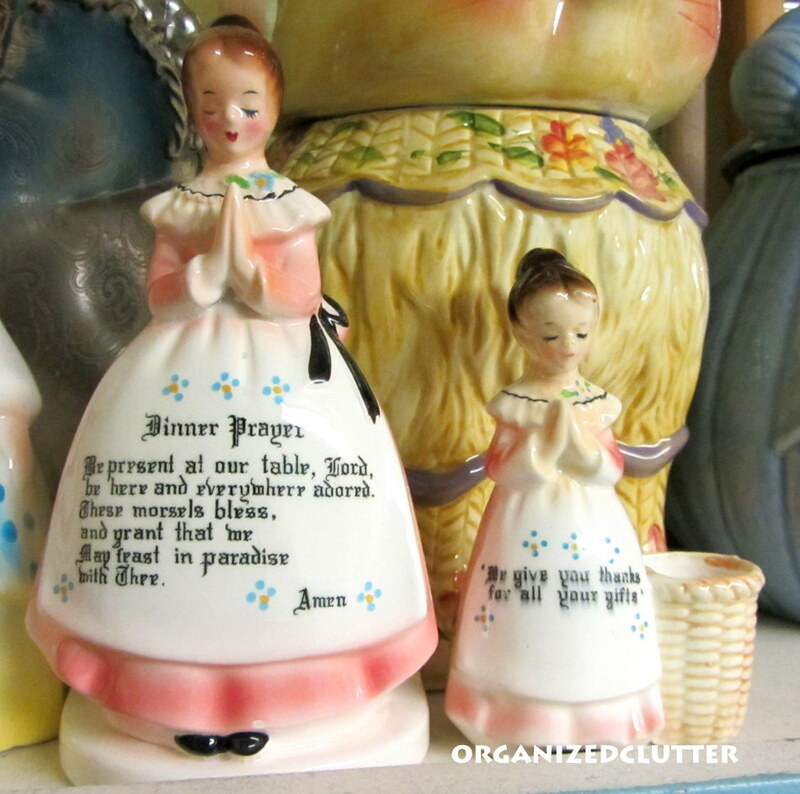 Enesco Prayer Lady napkin holder and toothpick holder. Enesco Kleanser Kate with holes in her head for shaking cleanser. Rubber stopper in the bottom. Holt Howard Jam 'n Jelly container. 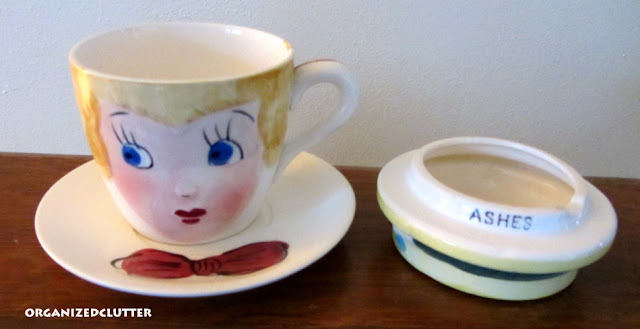 Maybe Relco, Japan, woman's head teacup, saucer and ashtray set. These are just a few pieces of my kitsch. I have more! Do you have any kitsch? Joining Ruth for Tuesday Cuppa at Antiques and Teacups. 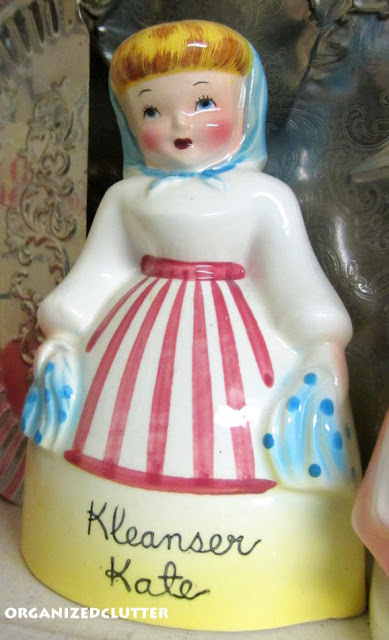 I have an old pig cookie jar that belonged to my husband's grandmother. The teacup/ashtray combo cracks me up! I still remember all of my grandma's friends smoking at her kitchen table. They all had the tupperware cigarette holders. Got one of those? My brother bought some of those prayer ladies for my Mom. That is the blessing we've always said at meals. And how dare anyone call them low brow? Hi, Carlene...shoot no, I don't have any of this fun stuff. Where do you find it? I never see any of it in our thrift stores but it all may be too olden to be in thrift stores. I'll look around,next time I'm in an antiques store...maybe I'll find a cute piece. All of yours is adorable. Kitsch? As I started scrolling down I thought....what's she talking about? Gotta say, when I continues to scroll I had to agree with you. I just backtracked to your previous post. Wow on the cloche made from a lamp shade. Awesome! I love the first picture. The only thing I can think of-and that would be for holidays perhaps-would be to wrap the wires with thin ribbon or tinsel or hang a tiny something from the top. I simply love it. I do not have any of these pieces, but they are very unique. Thank you for sharing them with us. 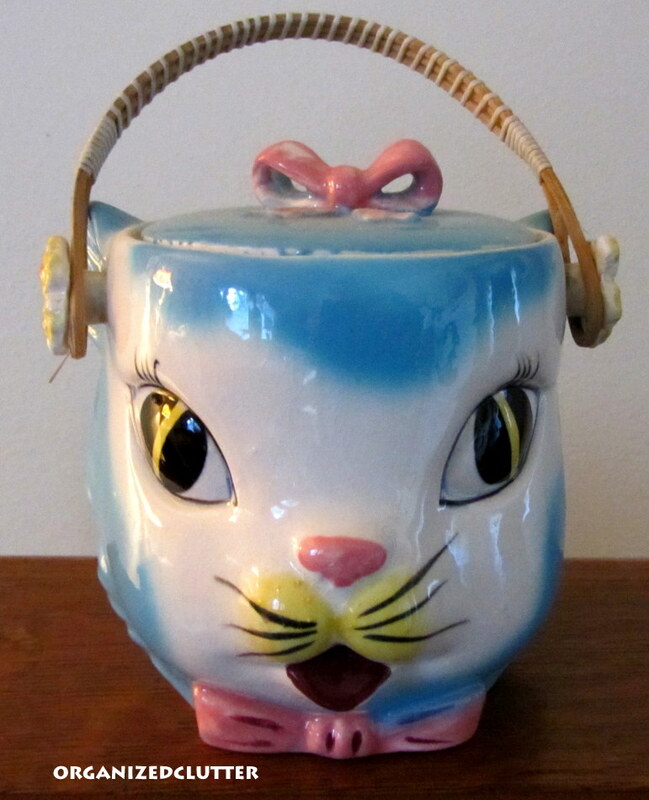 I love your cat biscuit cookie jar. Such a lovely kitsch collection. Oh I love the Kitsche stuff also. I don't have much but it catches my eye in the thrift sometimes! Hi Carlene1 Oh, I love these little sweeties. I have some salt and peppers similar to your little gals. How fun to see your cute little things. My momma, who didn't drive when I was very small, would take me on the bus to Woolworths where I could get lunch when she was done shopping. A grilled cheese sammy and a coke. Hahaha wow the the saucer, teacup and ashtray set is cracking me up. You are doing awesome at blogging every day! Yes! I have lots! But, it makes me smile every time I run across a piece. I don't use it in the house much anymore, but have a lot in our little museum! You have some great pieces! 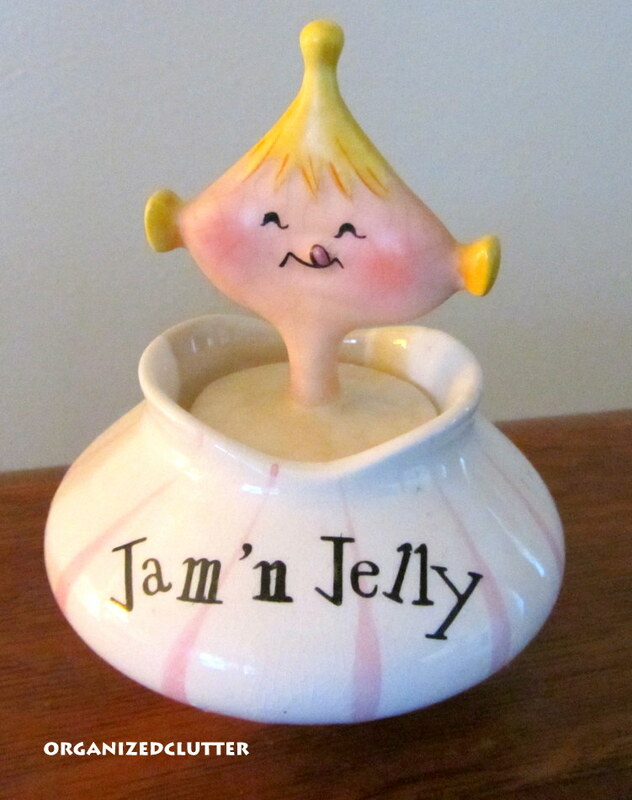 Your Holt Howard little Jam n Jelly jar is highly collectible. People will pay big bucks for that! I sold similar here in Australia for over $100! Hang on to it and take care of it. Kitsch for some is cute! Hi Carlene, I like the cat cookie jar, and the teacup ashtray combo is unique! Have a nice week. What fab goodies! Love the Holt Howard, and the teacup with ashtry lid is too funny! Amazing how that is changed! The kitchen prayer ladies are always wonderful! 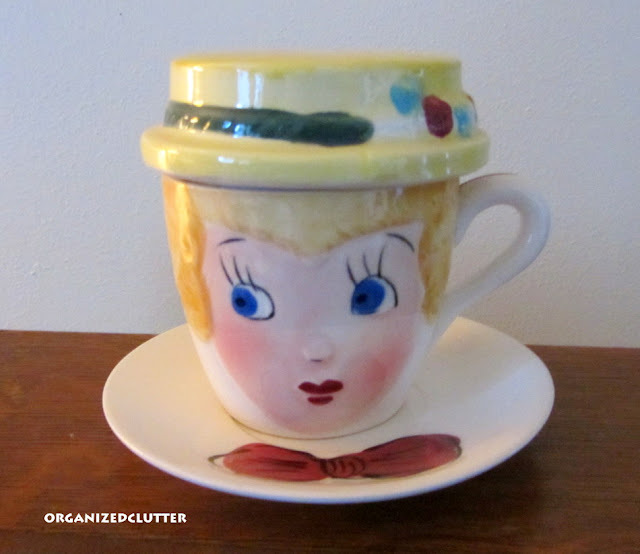 Thanks for sharing your treasures and linking to Tuesday Cuppa Tea! Well, beauty is in the eye of the beholder. I never knew there was a cleanser shaker! That's a great idea. I need one of those. Have to keep my eye out now that I know they exist. I don't have any of kitsh except a cool pink and black and white bride and groom salt and pepper shaker where they are in a "just married" car. That one item you have, the Howard Jam & Jelly is not considered low brow these days. It's definitely in demand by some who would likely pay decently for it. And the tea cup and ash tray...too funny! Carlene, you have some very unique pieces! The biscuit jar is cute and the prayer ladies too. Thank you for sharing with us and coming to tea. Have a lovely week. Love your fun post! All your Kitschy items are sweet. I adore the prayer ladys! The style, coloring and glazing they used are fabulous! Oh! They are all lovely! But that woman's head teacup...just amazing! My weakness! What a great posting! I love all your treasures especially the cup and saucer with the ash tray. Enjoy your kitsch for it is a wonderful collection. Thanks you for sharing this darling post! What fun pieces! I've never seen an ashtray with a cup and saucer before. Very unique! You have a great collection of kitsch going there!